Tea capsulesThere are 33 products. A classic blend of black Assam tea with the distinctive, fragrant scent of bergamot. Makes for a wonderfully soothing afternoon tea.May be enjoyed with or without a splash of milk, or simply with a slice of lemon or orange.Ingredients: Black Assam tea, bergamot. All natural, nothing else added. Green Tea Capsules Jasmine Tèespresso compatible Nespresso machine. Jasmine flowers are carefully selected to give a delicious floral touch to this tea. Black tea capsules Tèespresso intense flavor of lemon. A refreshing beverage to drink at any time of the day. Capsul & Bio, biodegradable capsules compatible Nespresso ® Black Tea Earl Gray Bio. This organic black tea is flavored with bergamot. 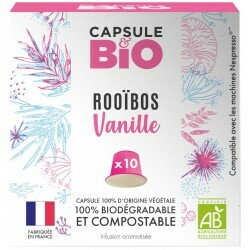 Capsul & Bio, biodegradable capsules compatible Nespresso ® organic Rooibos flavored with vanilla. This tea without theine is certified organic and its capsules are biodegradable. Ideal drink in the late afternoon and evening. Capsul & Bio, biodegradable capsules compatible Nespresso ® Black Tea flavored with Red Fruits. This black tea is certified organic and is flavored with red fruits. Discover the delight of this flavored tea. Capsul & Bio, biodegradable capsules compatible Nespresso ® Green Tea ginger lemon Bio. This green tea is certified from organic farming, it combines both the atypical taste of ginger, vitamins of lime.